A Florida man has pleaded guilty to falsifying quality reports for concrete used in the multi-billion-dollar project to extend Metro's Silver Line to Dulles International Airport. Andrew Nolan of Sarasota, Florida, pleaded guilty to a wire-fraud conspiracy charge Friday in federal court in Alexandria, Virginia. As News4 was first to report, officials found significant problems with the durability of the concrete used in the largest transportation project in the D.C. area. The largest problem has to do with concrete panels that serve as walls for the new Metro stations. In some cases, the water-to-cement ratio is off, the steel inside the panels is not covered by enough concrete and there are insufficient safeguards for water to expand and contract. In all of these cases, water could penetrate the panels, leading to cracking and rusting. 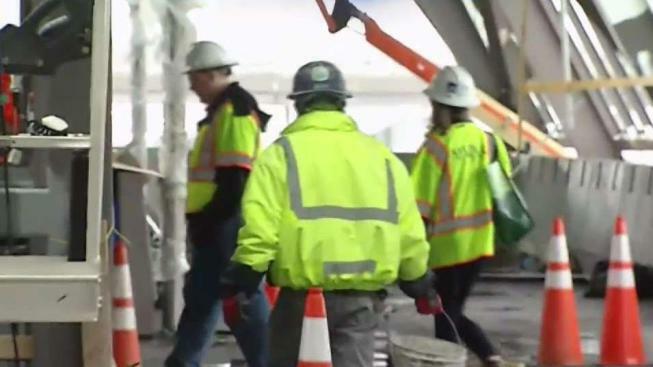 Charles Stark, the head of MWAA's Dulles Corridor Metrorail Project, previously told News4 the issue should have been identified before the panels were installed. The 11.4-mile extension of the Metro system will bring Metrorail to Reston Town Center, Dulles International Airport and Loudoun County for the first time. Metro said it will replace some panels and paint thousands of others with a special coating to correct the error. While there has been a whistleblower civil lawsuit filed in connection with the faulty concrete, Nolan's plea is the first criminal charge to come out of the case. He is set to be sentenced November 9.